With a mass more than 330,000 times that of Earth, the sun accounts for 99.86 percent of the solar system's total mass. But as stars go, the sun is a lightweight. The largest and most luminous stars in the universe are Wolf-Rayet stars, which are more than 20 times as massive as the sun and at least five times as hot. Only a few hundred of these titan stars are known to astronomers. 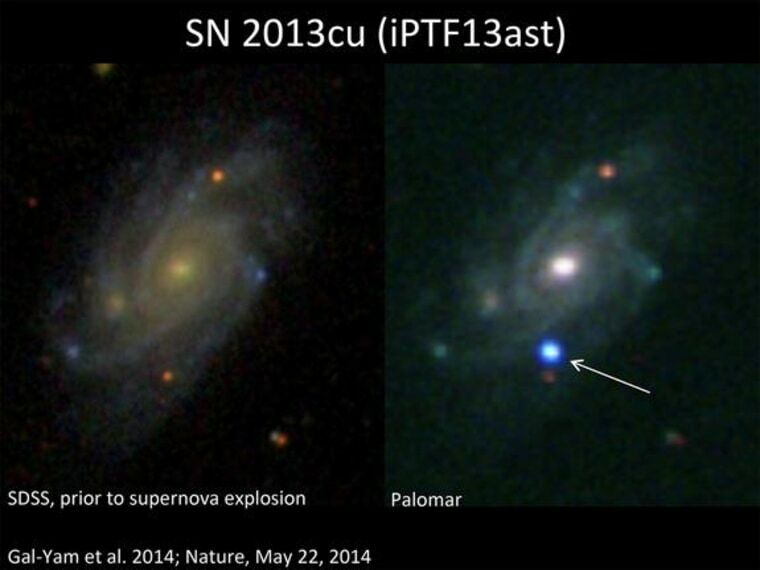 By surveying the sky with the intermediate Palomar Transient Factory (iPTF), a project that charts the sky with a telescope mounted with a robotic observing system, the researchers discovered the Type IIb supernova very soon after it happened. The explosion ionized surrounding molecules in an ultraviolet flash, giving them an electric charge. The ionized material that surrounded the star emits light that "tells us the elemental composition of the wind, and hence the surface composition of the star as it was just before it exploded," Gal-Yam said. This light suggested the precursor of the supernova was a nitrogen-rich Wolf-Rayet star. "This is the smoking gun," Nugent said. "For the first time, we can directly point to an observation and say that this type of Wolf-Rayet star leads to this kind of Type IIb supernova." This is a condensed version of a story that appeared on Space.com. Read the entire story here. Follow us @Spacedotcom, Facebook or Google+.